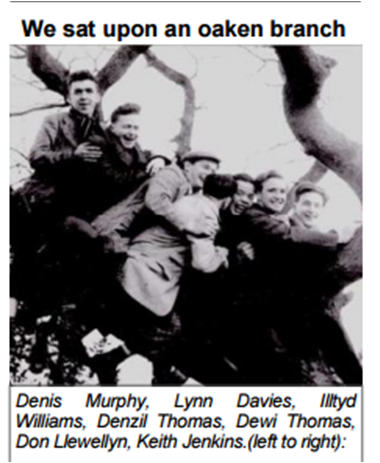 The Winter edition of the ​Pentyrch, Creigiau, Gwaelodygarth Community Link is out now and has an article about our club on page 12 and on the back page 28 there is an interesting feature about 7 Pentyrch residents, one of whom is our own Denzil Thomas, whose photograph was taken 64 years ago on an old oak tree! 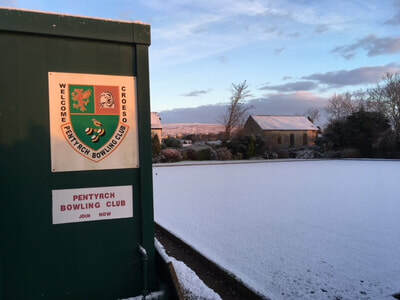 The first snow of the winter for Pentyrch fell on the evening of 8th December and in the early hours of the 9th creating a Christmassy scene at the bowling green as the sun rose. This was also the first snow to fall on the new pavilion at the end of its first year. 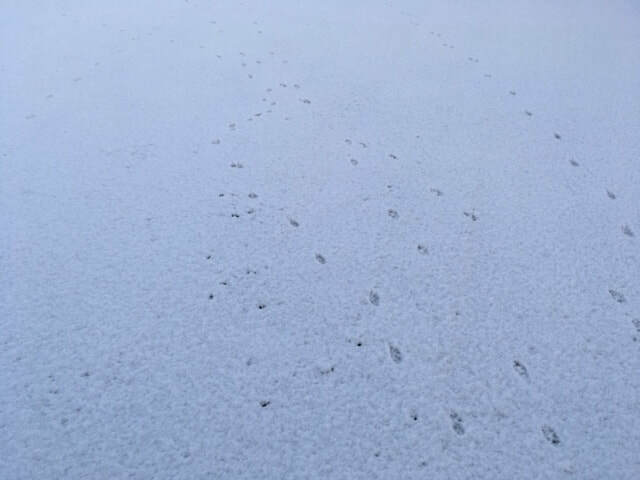 Unrecognisable animal tracks in the snow betray night time animal visitors. Well done to Eileen Boddington and her little helpers who made £103 for the club by selling chocolates and sweets at her stall at the Pentyrch Christmas Fayre on Saturday 25th November. Thanks to everyone who donated confectionery to sell. Always a winner at Christmas time. 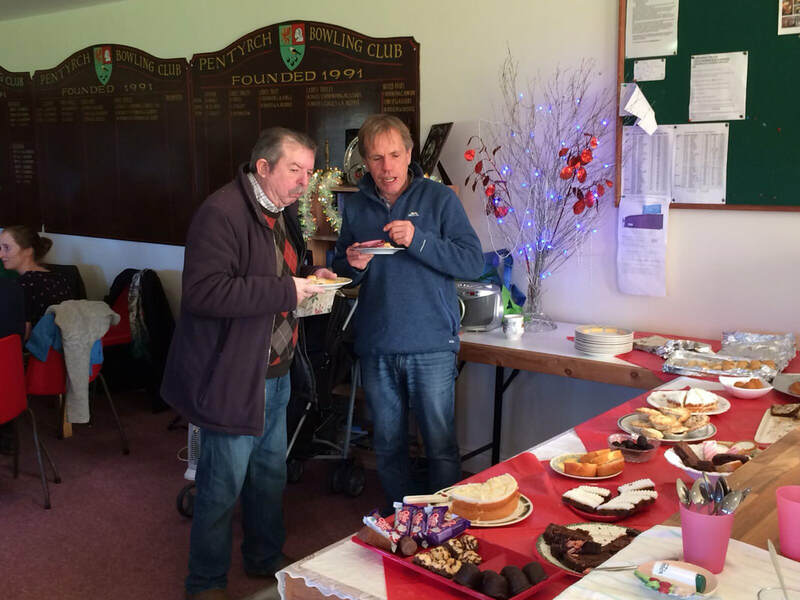 Our Christmas Cheese and Wine Buffet takes place on Sunday 3rd December, 4.00 pm at Pentyrch Rugby Club. Members and non-members welcome. Tickets are only £5 which includes a glass of wine , fine cheeses and magnificent buffet. You also get the chance to meet friends, make new ones, buy raffle tickets and exchange Christmas Cards! Don't miss out! Tickets available from Eileen Boddington. The first of our two traditional winter indoor fixtures will take place at Penarth Rectory Road on Wednesday 15th November at 7.30 pm. This is a friendly fixture which always proves to be a challenge on the superfast short mat rinks. A mixed team will be playing - please let new Captain, Ian Broxton know of your availability. Two plaques have been put up next to the John Roberts Memorial Clock. 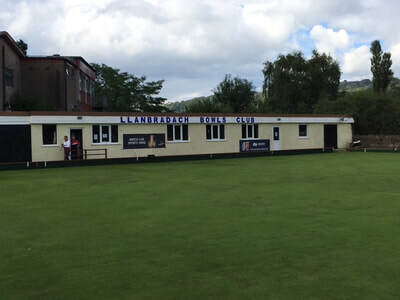 One plaque commemorates the Official Opening of the new pavilion by Huw Llewelyn Davies and the second is to recognise the enormous personal contribution that Brian Ilbery made in organising the planning, installation and building of the new pavilion. Recent work on demolishing and rebuilding the retaining wall at the West (tennis courts) end of the green has been progressing well in recent days thanks to the work of volunteers and kind weather. Thanks to John Berry for the photograph of the green showing how lush and strongly it is growing. 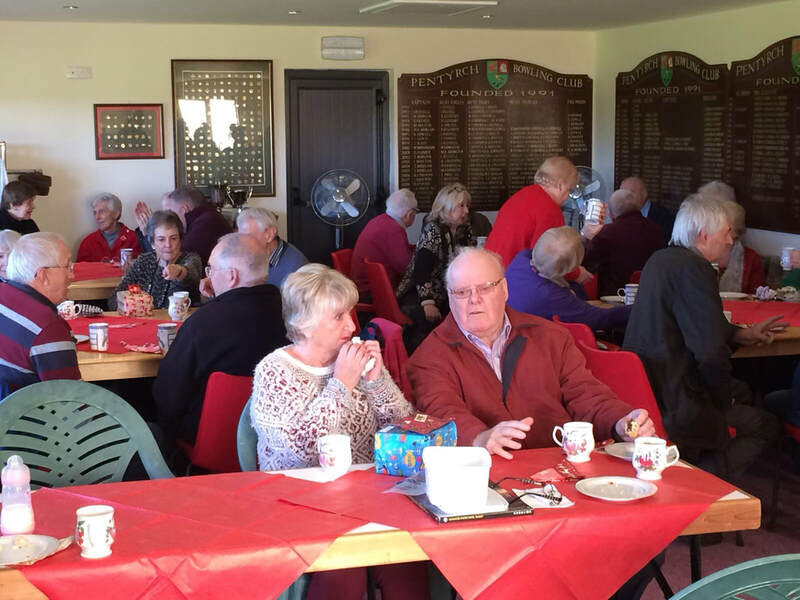 The 7th and final Coffee Morning of the year takes place on Friday 24th November at the Pavilion at 10.30 am. Everyone is more than welcome to a Coffee Morning with a seasonal, festive theme. If you've already been we'd love to see you again. If you haven't been yet, why not? This would be a great time to start... 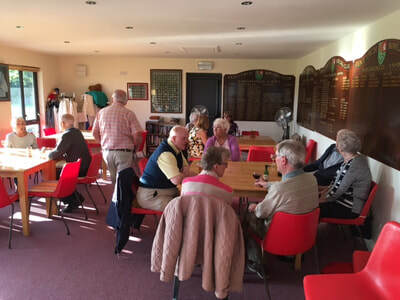 These mornings have proved very popular and successful in raising funds for the club as well as providing a chance for members and non-members to get together and socialise in wonderful setting. A reminder that this year's Annual General Meeting takes place on Thursday 2nd November, 7.30 pm at Pentyrch Rugby Club. Please make every effort to eattend to vote on proposals and new committee positions and to review the recent season and plan for the future. 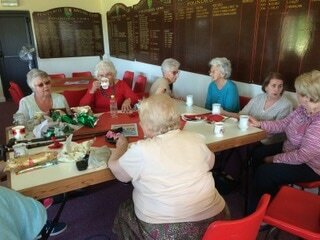 Friday 27th October was the date for our 6th Coffee Morning. 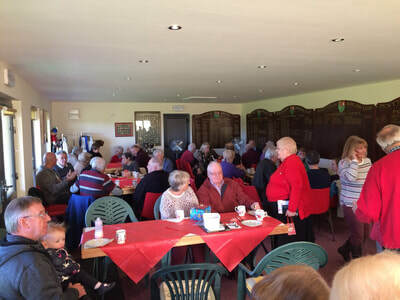 A beautiful sunny Autumn day heralded the most successfully profitable Coffee Morning so far with £162 raised. This just shows what can be done with effort ,commitment and teamwork. Thanks to everyone who came along and supported the day. 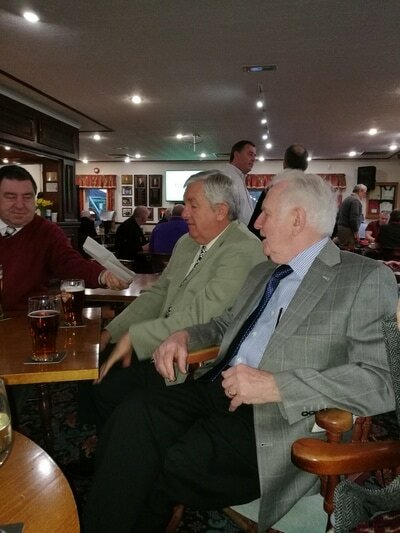 It was great to see club legend Tim Morgan and many others. 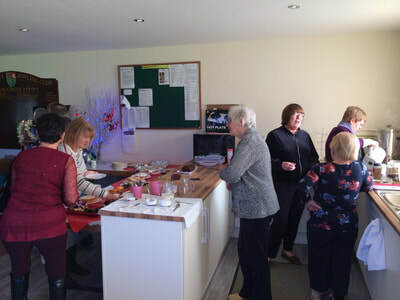 Special thanks to Kath Morris for doing the raffle and to Lynne Ilbery for making and serving the tea and coffee. 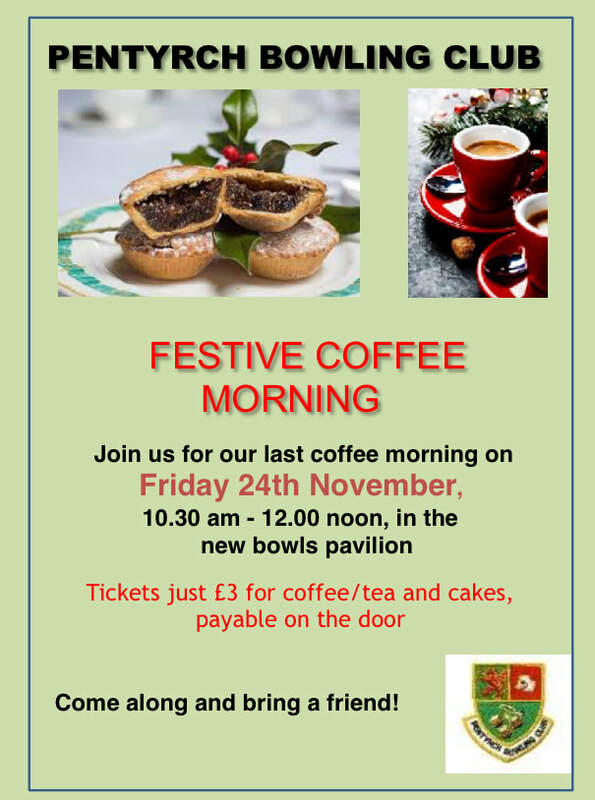 The last Coffee morning of the year will be on Friday 24th November and will have a festive theme! Please come along and bring some friends. ​John Berry organised a working party of volunteers to demolish the retaining wall at the west (tennis court) end of the green today. The wall has begun to collapse and needs to be replaced. Once demolished, it will be replaced with a new one. Huge thanks to everyone who helped. It was a relief to have a calm and sunny day for the work after the turbulent winds of Ophelia the day before. 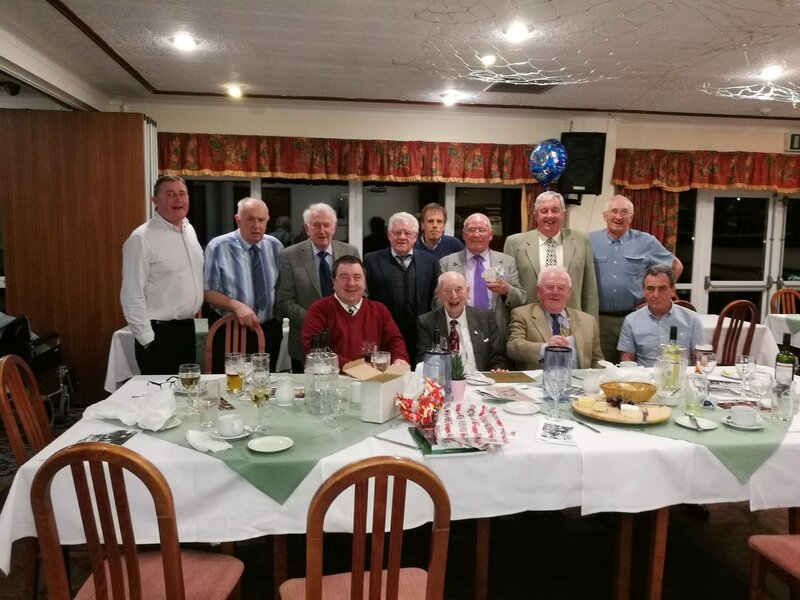 This year's Annual Presentation and Dinner was held at Creigiau Golf Club on the evening of Friday 13th October 2017. More pictures on separate page here. 9th October 2017: Bill Malcolm, our Greenkeeper has carried on with work on the green from a couple of weeks ago when the tine machine was used to make thousands of perforations in the green to allow sand to be brushed into the holes. This will help greatly with drainage. Today he gave the green it's first cut since the recent treatment and says he is pleased with how it's doing. Bill wishes to pass on his personal thanks to the "Magnificent Seven" helpers who worked hard to brush sand into all of those holes. 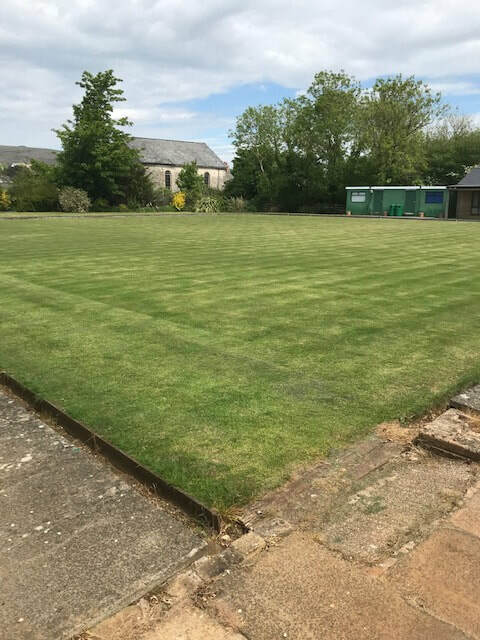 The Club would also like to pass on it's thanks to Bill and his assistant, Paul for all the hard and often unseen work that they do to keep the green in great condition throughout the year. Hopefully many of you have enjoyed reading Mark Krawiecki's match reports over the last two seasons. 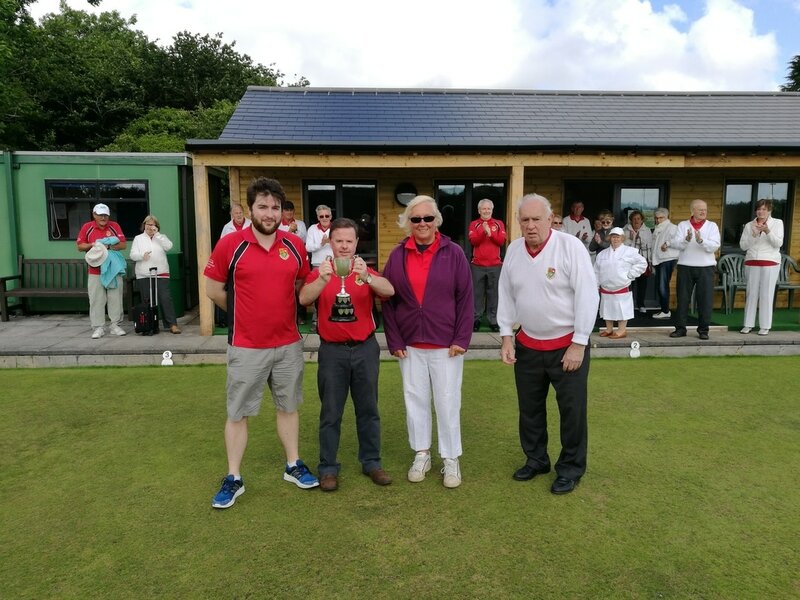 They have certainly not gone unnoticed in the wider bowling community thanks to being shared on social media via Twitter. 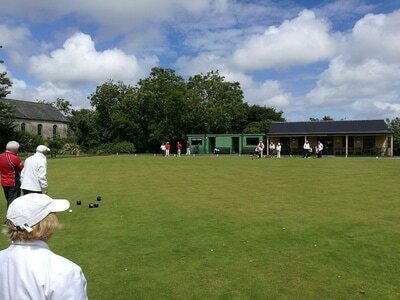 Welsh Bowler Magazine, an online bowls magazine recently published one of Mark's reports of a PG1 match at St Fagans. Of course, you can read all the other reports on our own website here. 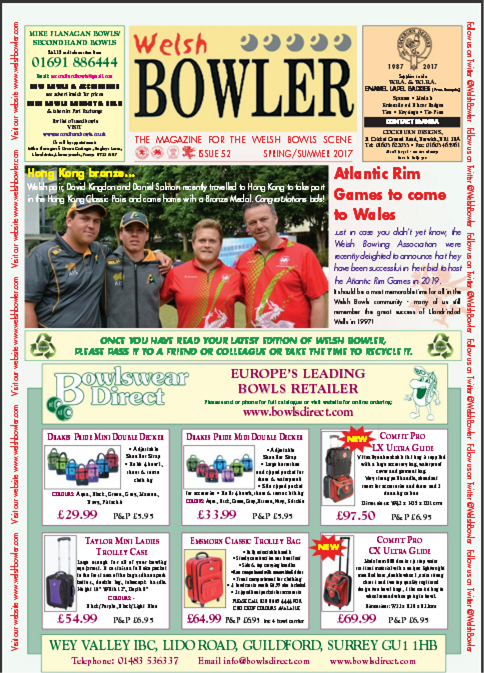 The full edition of the current issue of Welsh Bowler Magazine can be read here. 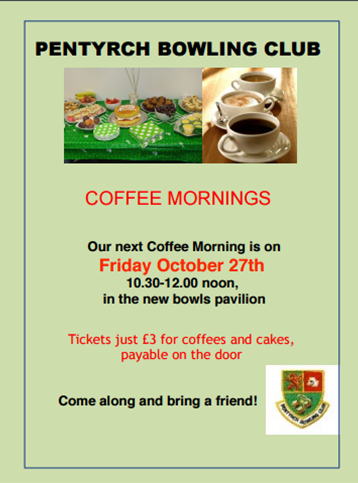 The penultimate Coffee Morning of the year will take place at the Bowls Club at 10.30 am on Friday 27th October. Please come along to enjoy and support what is a great social occasion that has significantly helped to pay for our wonderful pavilion. All funds raised go straight back into club funds. Thanks for all the support from everyone so far, and if you haven't been yet come and find out what you've been missing! Everyone welcome, including non-members. A year on from construction the pavilion had its first coat of preservative this week 05/10/2017. 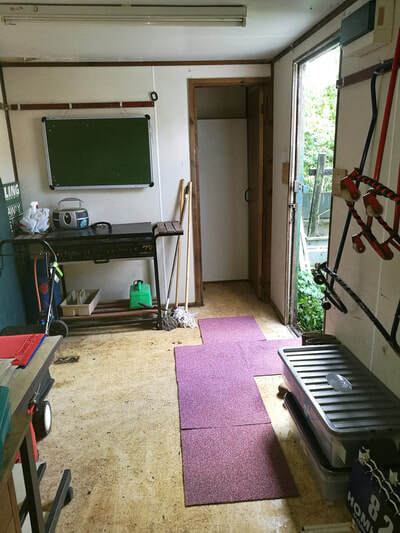 See the New Clubhouse page for pictures and details. Bill Malcolm, our greenkeeper has been finishing the vital end of season work of "top dressing" the green. Thanks to him and to all the volunteers who have been helping to brush the sand into the thousands of holes made by the tine machine. Morning of Friday 22nd September - a week earlier than usual to avoid clashing with the Macmillan Coffee Morning that will take place on Friday 29th September. 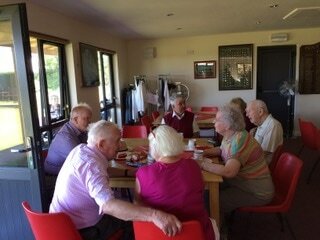 A friendly and happy gathering as usual and an opportunity to keep in touch in the close season. 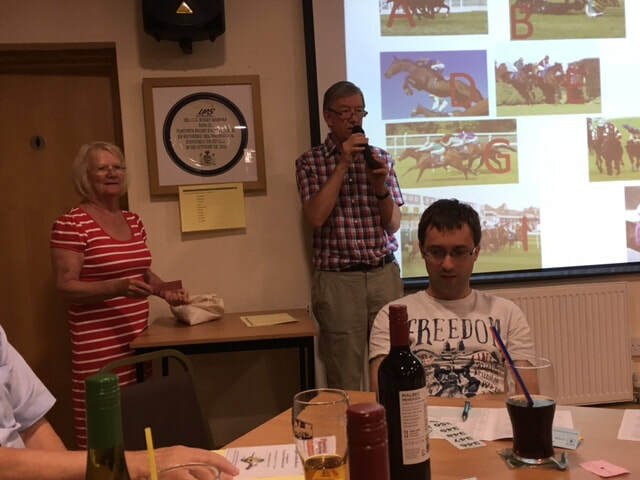 Well done to the raffle winners: Pat Owen, Ian Brixton and Janet Wilson. 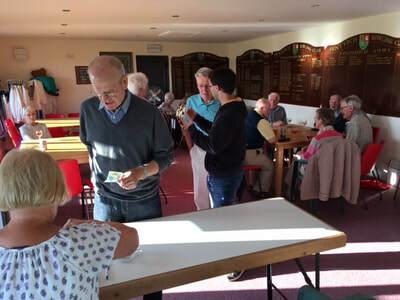 Thanks to the helpers, organisers and guests who helped to make a profit of £121 all of which goes to pay for the wonderful clubhouse and its facilities. 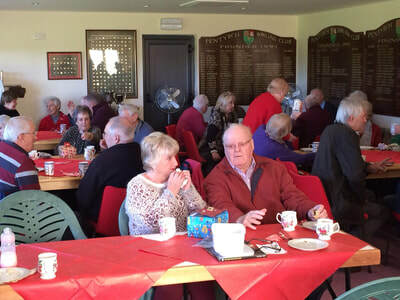 There will be two more coffee mornings this year. Friday 27th October and Friday 24th November, with a festive theme ready for Christmas. Everyone is very welcome to come along. With the outdoor season finished, Bill Malcolm has hired a special tine machine that makes thousands of holes in the green, into which sand can be brushed to improve drainage. This is just part of the extensive work that Bill and Paul will be doing during the close season to provide us with the great playing surface we enjoy. Bill was at work earlier this week making 600,060 thousand holes into which volunteers will be brushing sand. All helpers welcome! 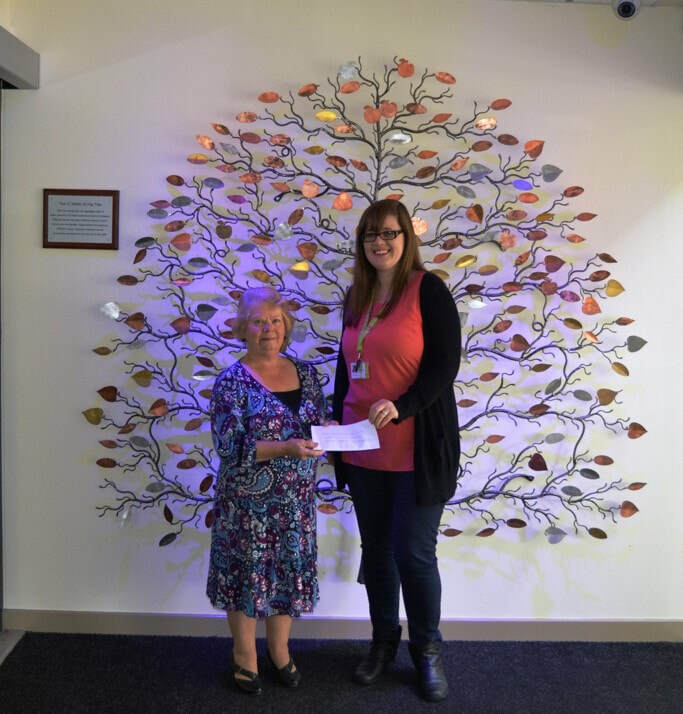 Club Chair, Jan Berry recently presented a cheque for £125 to ﻿Ty Hafan﻿, Children's hospice. Ty Hafan is one of the UK's leading paediatric palliative care charities, helping children and families throughout Wales. The £125 was part of the money raised through this year's Season Long Raffle. Thanks to everyone who took part and especially to the ticket sellers - a great effort! Finals Weekend is this Saturday 9th and Sunday 10th September. Come and support the players, enjoy the company of the spectators and have a last go at winning the Season Long Raffle. Novices' Cup and Men's Pairs on Saturday. Men's Triples and Men's Singles on Sunday. 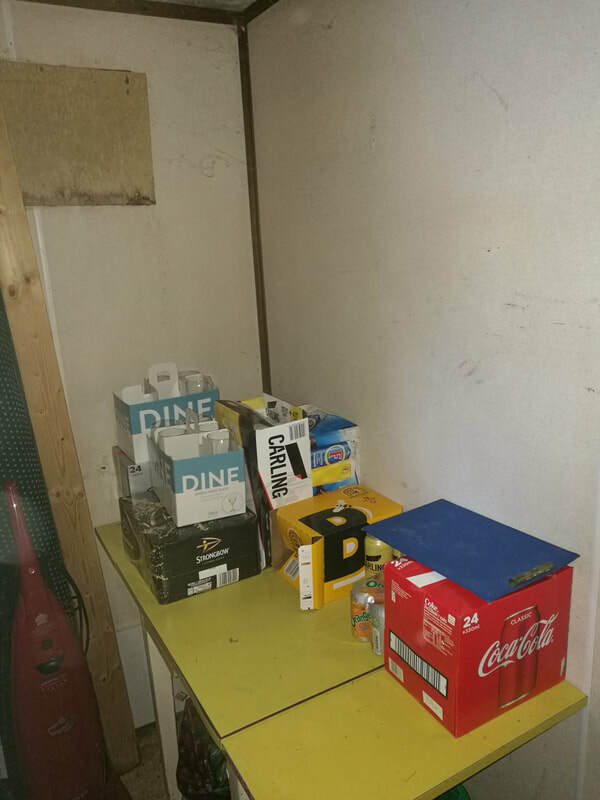 Click here for photos and report. 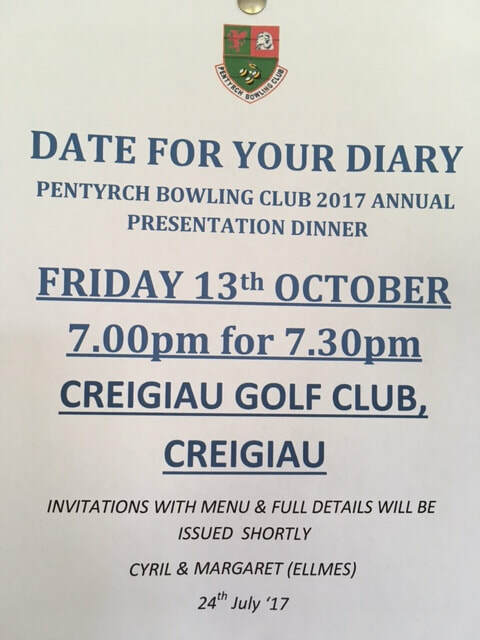 This year's Annual Presentation Dinner will take place at Creigiau Golf Club on Friday 13th October. Once again, our thanks to Margaret and Cyril Ellmes for organising the event. 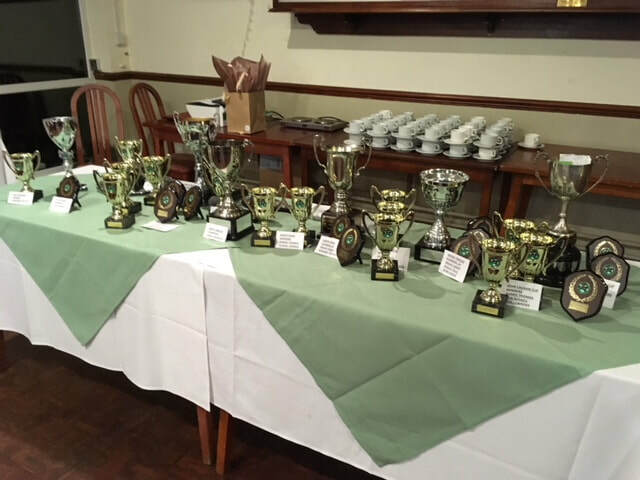 It is always a great social event and a chance to look back on the outdoor season and to celebrate our successes, on and off the green. Please make every effort to attend and support the event. ​Please contact Margaret or Cyril for menu choices and costs. Friday 19th August - John Berry, Jeff Tarr and John Eagle spent some considerable time tidying up the TARDIS today. A number of broken and unused items that have accumulated over the years have been removed for disposal. 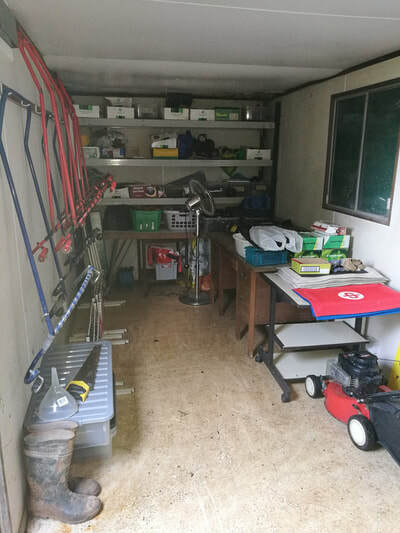 All the remaining bowls equipment: spare bowls, mats, jacks, markers, shoes, pushers etc have been tidied making it much easier and safer to find equipment. Please, would all members take great care in replacing anything used properly and in the correct place? 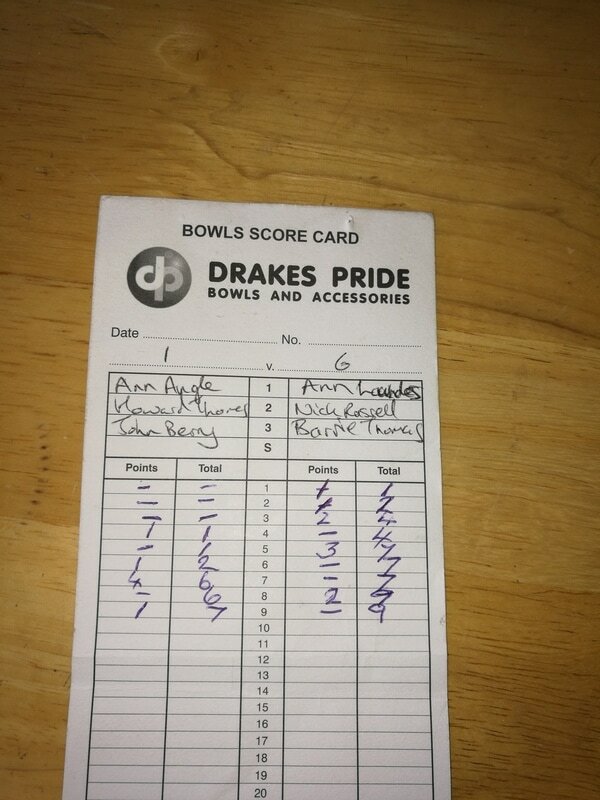 This is particularly important when returning bowls to correct boxes to make sure that full and matching sets remain complete. Big thanks to John, Jeff and John. One of the main aims in having the new clubhouse built was to have a suitable venue to allow us to stage more social and community events. 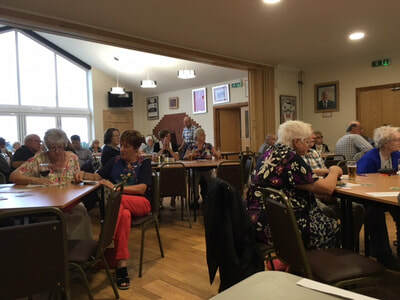 To that end, so far, we have held three coffee mornings and on the evening of Tuesday 15th August we held our first bingo night. 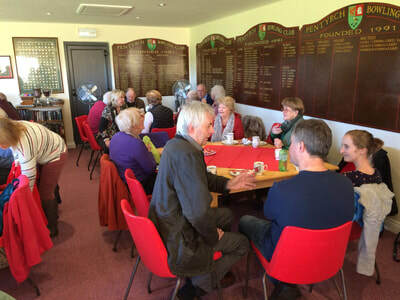 The event was open to members and non-members and was attended by 27 people, a mix of members and non-members. It was a fun and lighthearted evening very ably hosted and compered by John Berry. 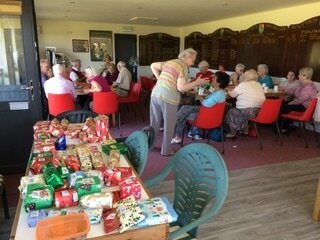 Thanks to John, Jan and Liz Cugley for running the bingo. 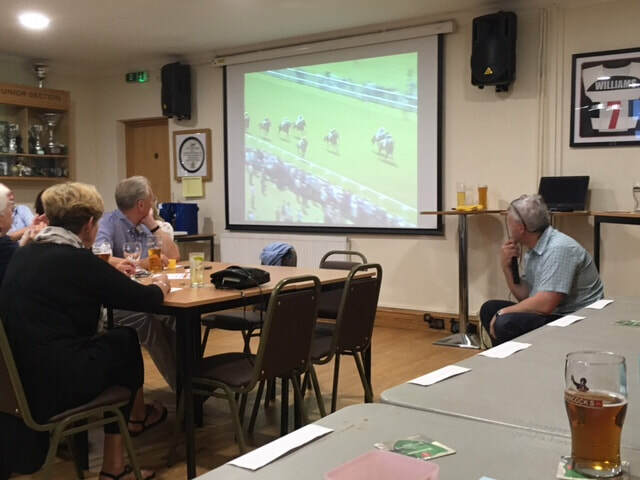 Thanks to Dave and Jeff for running the bar and refreshments and to Sheila and Castle Bingo for organising and donating some of the prizes. 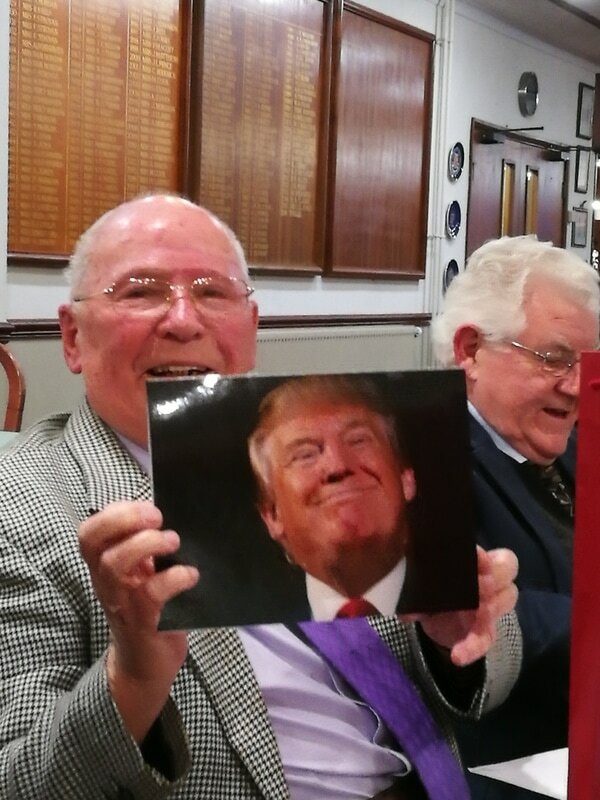 Also thanks to everyone who came along, had a great time and most importantly helped to raise much-needed funds to keep our club going. The total raised after paying out very generous prizes was £134. 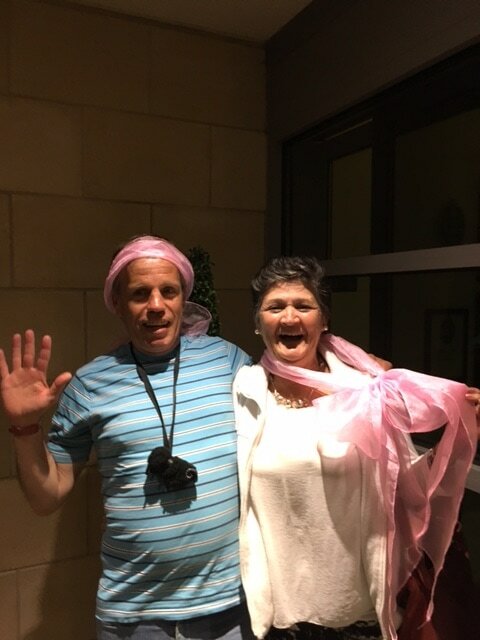 There will be more bingo nights, so if you missed out this time, you will be more than welcome next time. House! Well done to Howard Thomas on winning the Two Wood Competition last Sunday, beating new member, John Davies in the final. 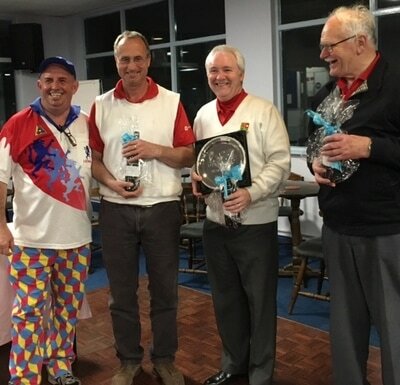 Thanks to all 10 players who came to support and take part in the event and huge thanks to Iain Russell for organising and running the event on the day. More support for these events would be very welcome. Don't use it, lose it. 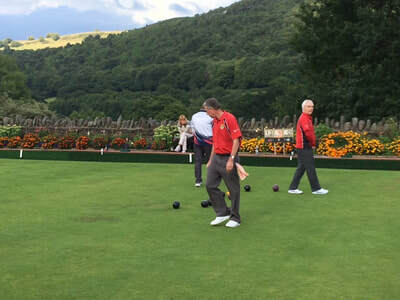 On the evening of Friday 5th August, a single rink representing the club played in the quarter final of the East Wales PGBA . The match was played away at Llanbradach, a club with a long and successful tradition and history in Welsh bowls. 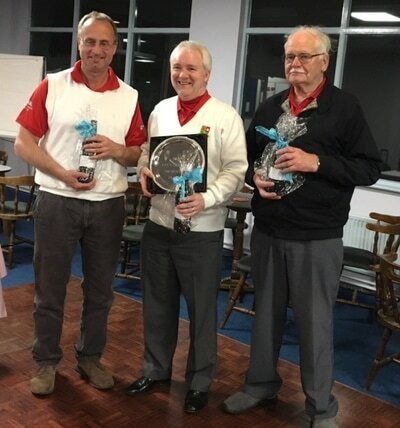 The Pentyrch rink was Mark Krawiecki, lead, Barrie Thomas, second, Brian Ilbery, third and Iain Russell, skip. They began the match optimistically but proved no real match for the consistency, skill and sometimes sheer brilliance of their opponents. In the end, the score of 31-6 was academic and despite the heavy defeat, the Trychs enjoyed playing and admiring the skill that can be achieved when the game is taken to another level. 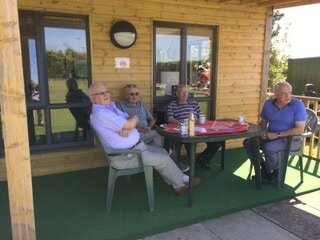 Thanks to James, Aidan, Leighton and Fred for your company on and off the green and good luck in the semi-final against Whitchurch. 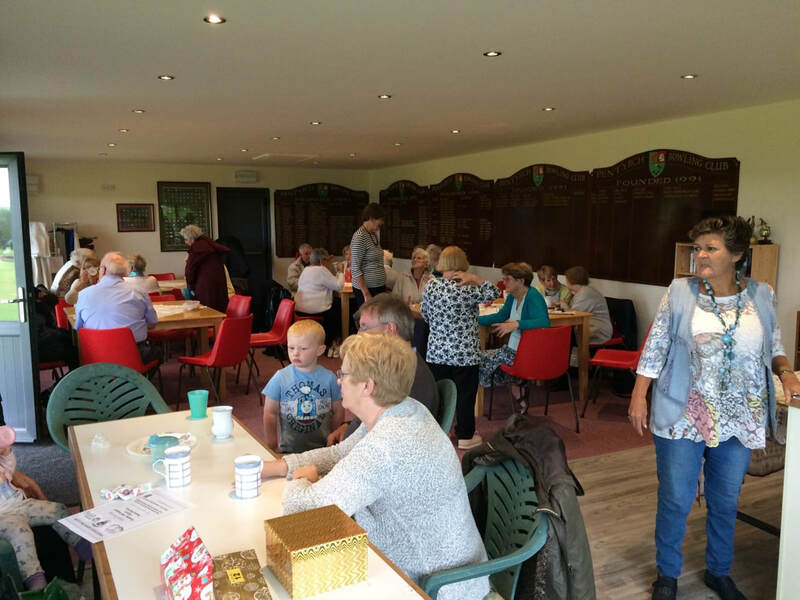 To take further advantage of our new pavilion as a meeting place and venue for social events, we are holding a Bingo Evening on Tuesday 15th August. Doors open at 6.30 pm with a 7.00 pm start. There is no entrance fee, simply turn up and buy your books of tickets. Drinks available to refresh you as you try to win the fabulous prizes on offer! This event is open to everyone in the community, members and non-members. 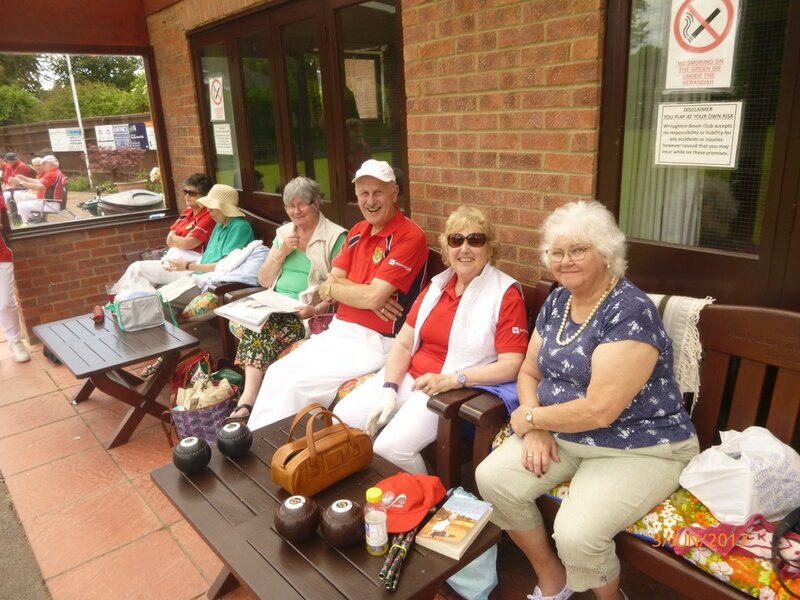 The Annual Two Woods Singles (Mixed) Competition takes place this Sunday, 7th August at 2.00pm. Please turn up at the club by 1.30pm for the draw to take place. Thanks to those who have put their names down for availability. Entries accepted up until 1.30 pm on Sunday. Good luck! On Friday 28th July, we held our third Coffee Morning in the new pavilion - another success! 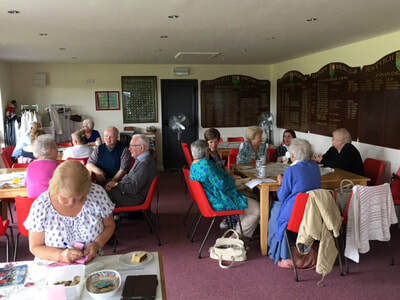 30 people braved the unseasonal weather and while having a pleasant morning socialising and eating delicious cakes helped to make a profit of £95 which will help to pay for the verandah. Thank you everyone. 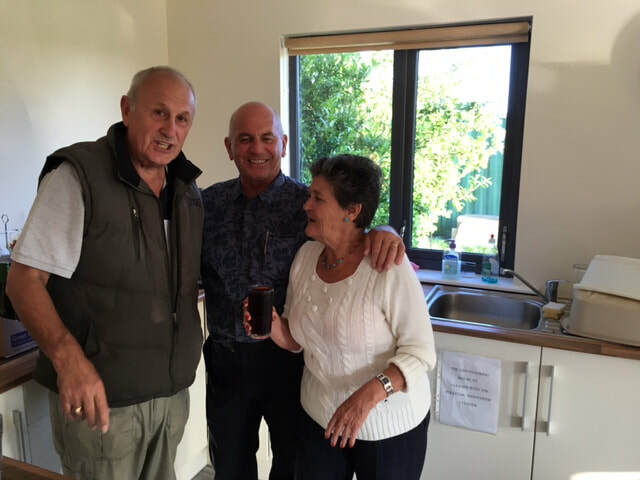 Thanks also to Val for running the Tombola and to all the helpers, especially to Bev and John - the coffee makers. These events are a great way to socialise, meet people and to introduce others to our great game - please try to support and encourage others to come along. 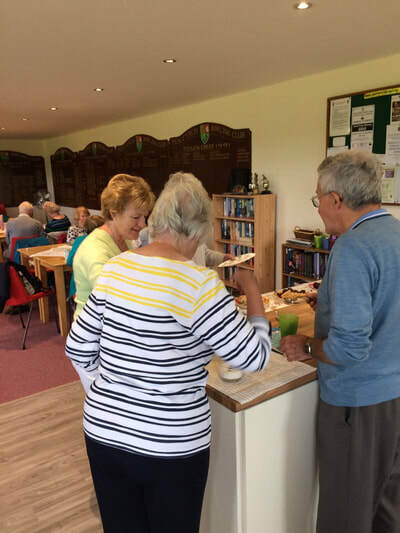 Next Coffee Morning is on Friday 25th August. It's great to have Bill Malcolm, our greenkeeper back at work on the green. 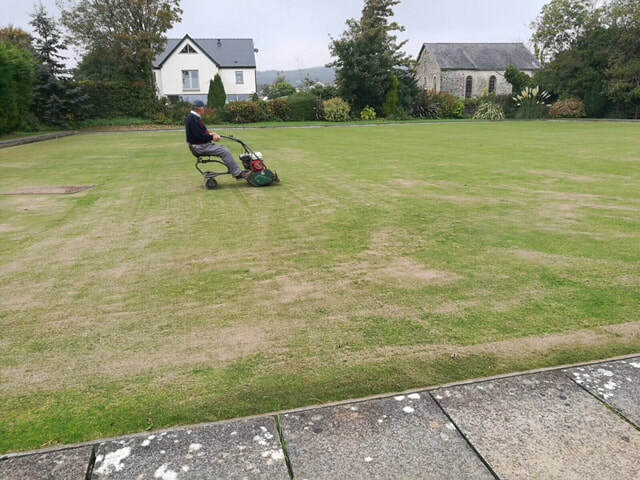 While some of us are still lying in bed in the morning, chances are that Bill is down at the club mowing, rolling, fertilising and working hard to maintain the great playing surface that we all enjoy. John Berry was up early recently too and filmed Bill "on a roll" getting the playing surface ready for the visit of children from Pentyrch Primary School and Saturday's PG1 fixture with Pontyclun. 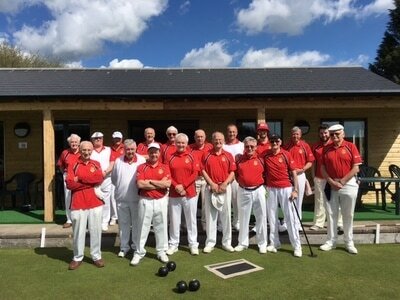 On the afternoon of Friday 14th July a large group of the older children from Pentyrch Primary School took the short walk down the hill to the Bowls Club. 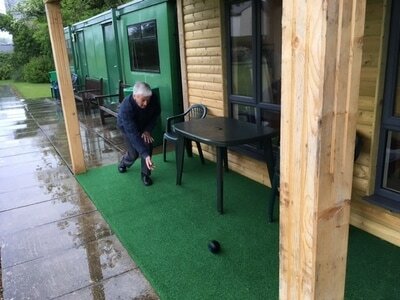 The children were given an introduction to the game of bowls and after some coaching took part in a small tournament amongst themselves. The children thoroughly enjoyed themselves and we were blessed with a bright, warm and sunny afternoon. Thanks to Mrs Keenor, the class teacher for bringing the children and encouraging them to take part in sporting activities. Huge thanks to Brian Ilbery, Jan and John Berry, Howard Thomas, Eileen Boddington, John Eagle, Jeff Tarr, Dave Ashmore, Margaret Farmer, Keith Capron and new member John Davies for helping on the day. 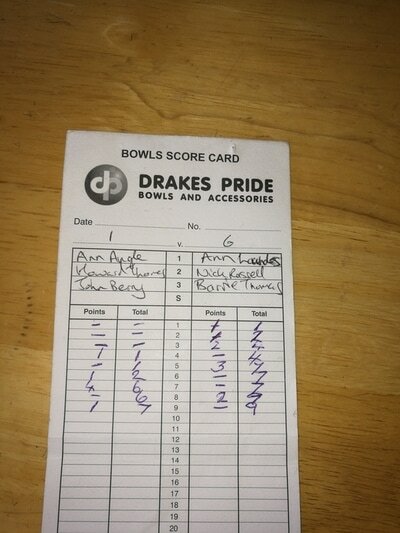 Thanks to Bryn Owen for providing more bowls for small hands and to Mark Krawiecki for organising the event. This is the first event involving local schools for a while and we hope to make it a more regular fixture in our calendar. It helps to foster a partnership with the community and to, hopefully, encourage membership from a wider source. 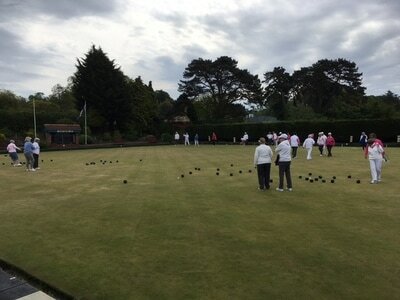 Thanks to Jan and John Berry for organising a fantastic day trip to Pineholt Bowls Club near Gloucester. Read all about it and see more pictures here. Another really successful and enjoyable evening was had by everyone at our third Grand Race Night. Very well-organised by Brian Ilbery, the Social Committee and run by Andrew and Ruth Davies of AD Computers. Thanks to Peter Mynett, Jan and Kath Morris for organising a successful raffle, the Tote helpers, Sue James and bar staff of Pentyrch Rugby for the catering and venue. Most of all, thanks to everyone who came and supported the event - we really are grateful for your support. You are always welcome at our club, especially if you have a go and take up the game. Well done, to Anne George and June Sexton for training and owning "Anne's Girl", champion horse, who won Race 4 and went on to win the Winners' Race. Our second Coffee Morning takes place on Friday 30th June in the New Pavilion. 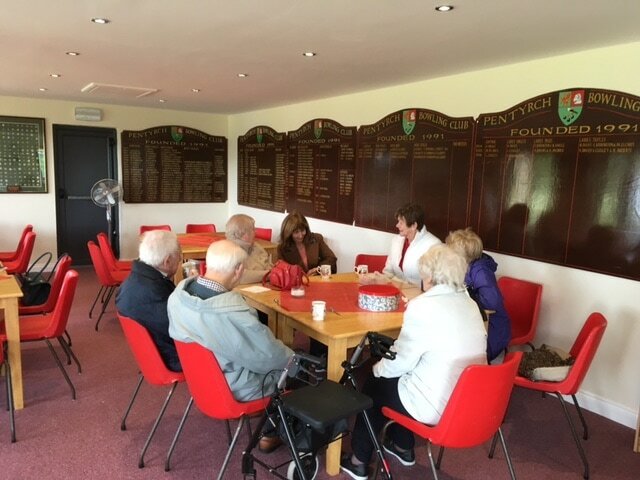 It's a chance for anyone, members or non-members to relax and socialise and enjoy the wonderful surroundings of the clubhouse and the gardens of the club. With the verandah you can still enjoy being outside even if it's raining. The first event was a great success with 38 people attending. Drink coffee and enjoy delicious cakes and have a go at winning in the Tombola. This, all for the bargain price of just £3! All money raised goes to club funds. Thank you. Post-Script: Another good turn-out for the second coffee morning with over £100 raised in entry costs and £20 on the tombola. Huge thanks to volunteers, guests and cake bakers. A great chance to socialise and raise money for the club. 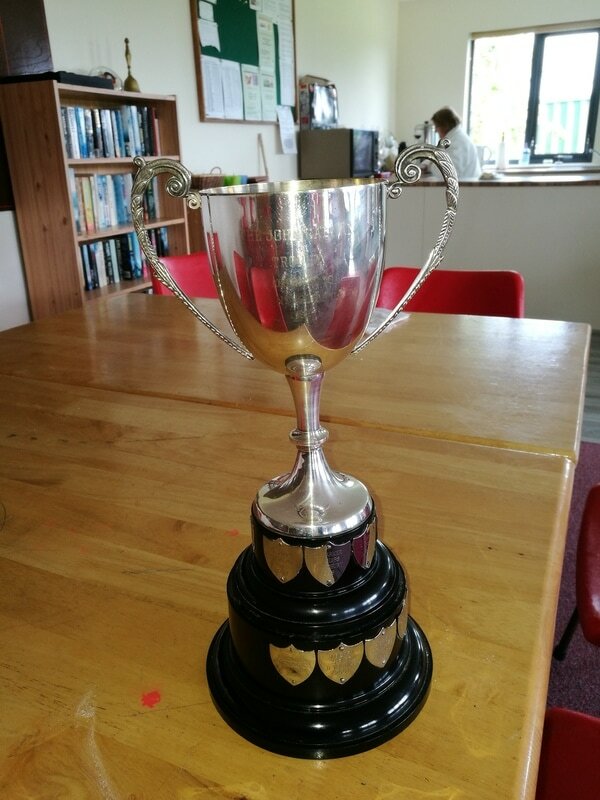 Sunday 11th June: This year's John Calnan Cup an internal club competition of two wood mixed triples was played on a very blustery, but thankfully dry afternoon. 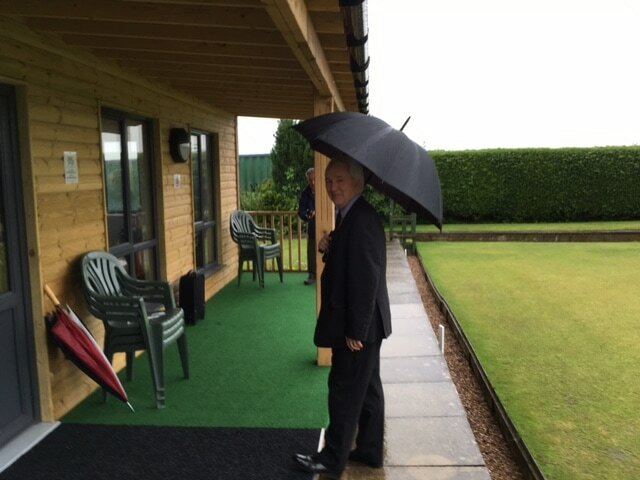 A wet week had seen two postponements of league fixtures due to rain and it was good to get back on the green for the first time since last week's tour. There was a good turn out of around twenty players. 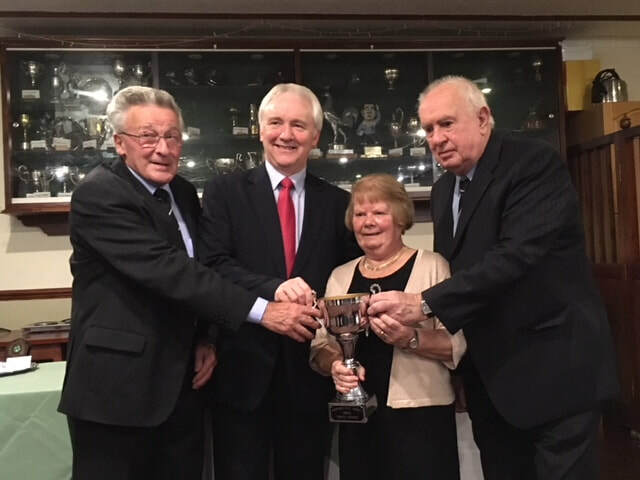 The final and trophy was won by Nick Russell, new member Anne Lowndes and Barrie Thomas, presented by Club President, Russell Howell - congratulations to the winners and commiserations to the runners-up, Ann Angle, Howard Thomas and John Berry. 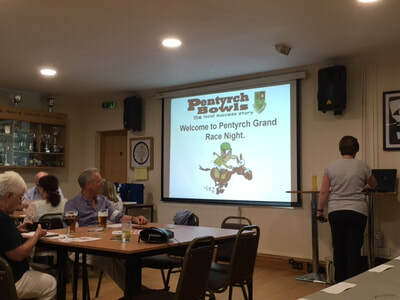 Our third annual Horse Race Night takes places on Friday 7th July, 7.30 pm at Pentyrch Rugby Club. 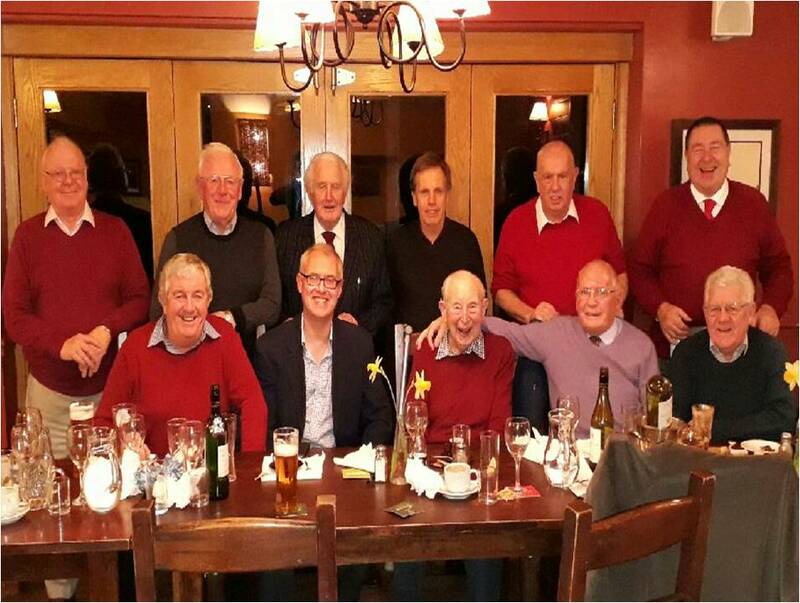 Join us for what has become a legendary event in the Pentyrch village social calendar. It's a great evening of entertainment, excitement, meeting old and new friends and a great way to boost club funds. Tickets still available. The Summer Quiz on Friday 9th June at Pentyrch Rugby Club was a great success. Over £650 was raised which will be a very valuable contribution to club funds and will help to pay for the verandah of the new pavilion that many people are already enjoying so much. A massive thanks to the organisers, and to all the contestants for taking part - we hope you enjoyed it. Looking forward to seeing you again later in the year at our other social events. Anyone who is not yet a bowler, why not join us on the green too? 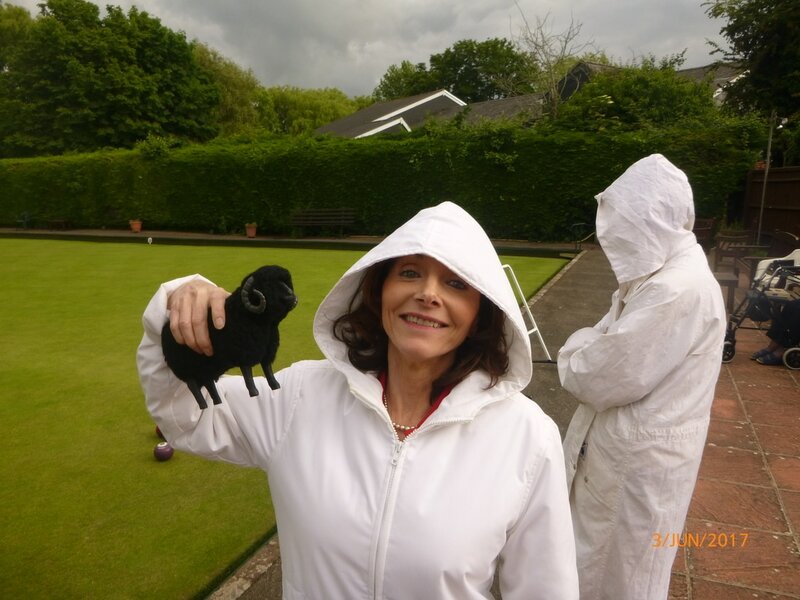 Thanks to Howard Thomas and Peter Mynett for organising this year's tour and to Kath Morris for help with the entertainment and looking after the Rams! Go to the Tour 2017 page to see more. 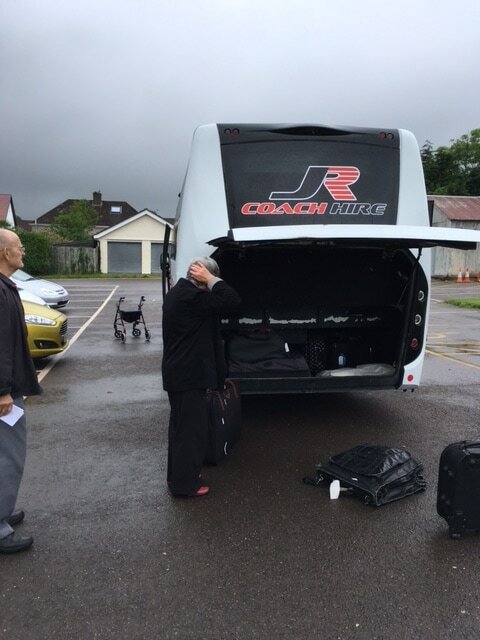 Friday 2nd June and our Annual Tour gets underway, leaving a rainy Pentyrch behind. 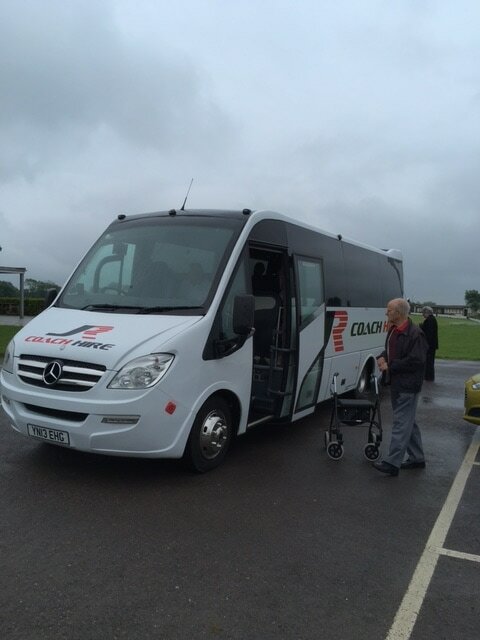 For more about the tour itself, click here. A reminder that our annual tour begins next week. Make sure you pack your woods! We will be touring in Wiltshire and Bristol. Our base will be the De Vere Hotel, Wroughton for the nights of Friday 2nd and Saturday 3rd June. On Friday our opponents will be ​Wanborough Bowls Club. 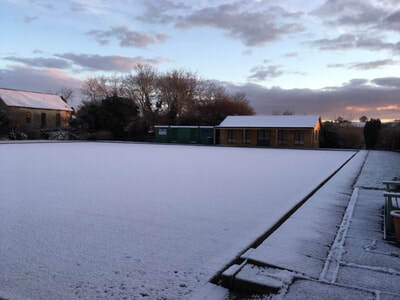 On Saturday we will play against Wroughton Bowls club. 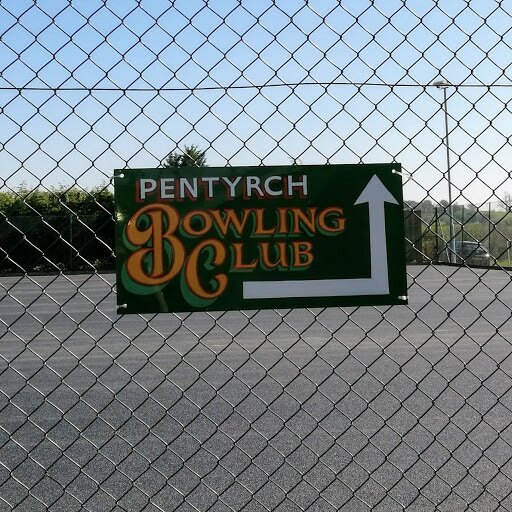 On Sunday 4th June we are due to play against Yate Bowls Club, near Bristol on the way home to Pentrych. On Friday 26th May, the Club held its first Coffee Morning at 11 o'clock. A great success with 38 people attending. 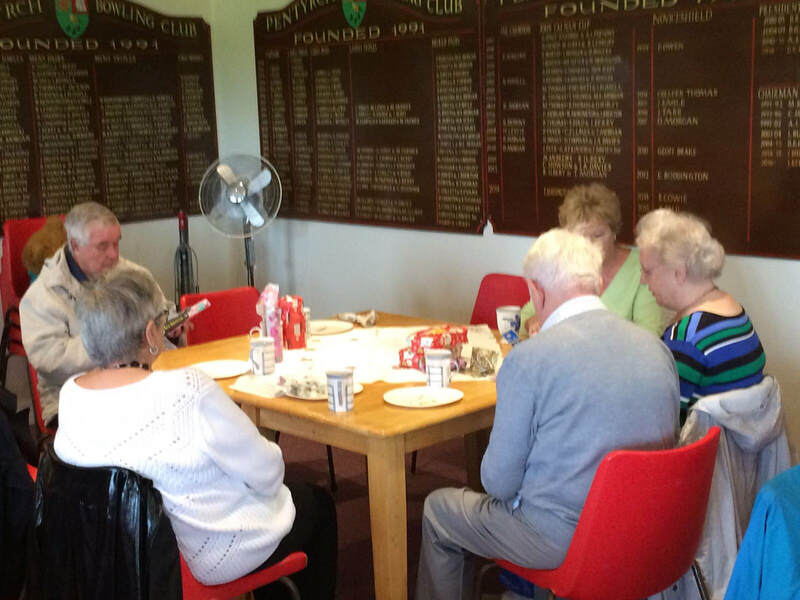 It's intended to hold these coffee mornings once a month on a Friday morning - the next will be on Friday 30th June. It was a pleasant time for a get-together and enjoy our great new building. The new pavilion has given us the opportunity to host such events in comfort and to become more open to the local community. 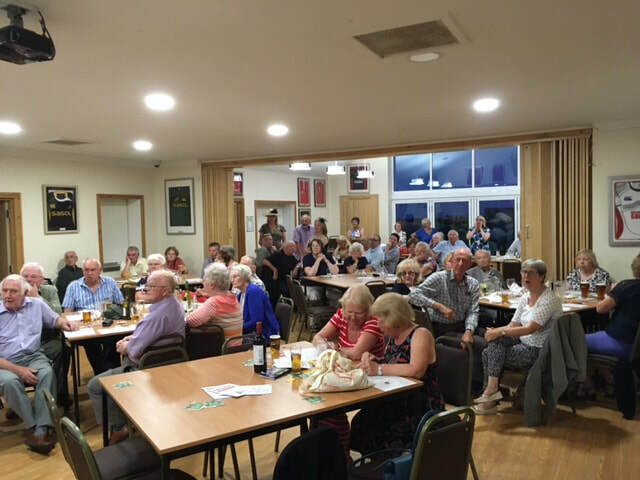 We hope that in the coming months, word will get round locally and it will raise our profile and in turn encourage others to join, as well as a way of raising funds to keep the club going. 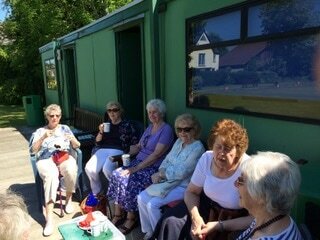 The beautiful weather helped, of course, allowing guests to enjoy the verandah and the wonderful surroundings. 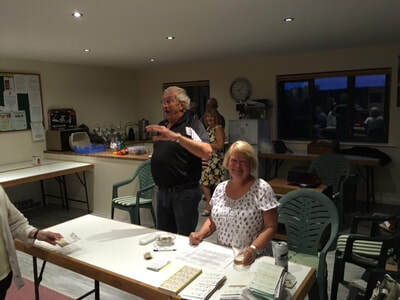 Thank you to the many who helped with organising the first event, with special thanks to Brian, Lynne, Eileen, Bernie and especially Val for the tombola! Monday 15th May and Spoons was rained off for the first time this season. 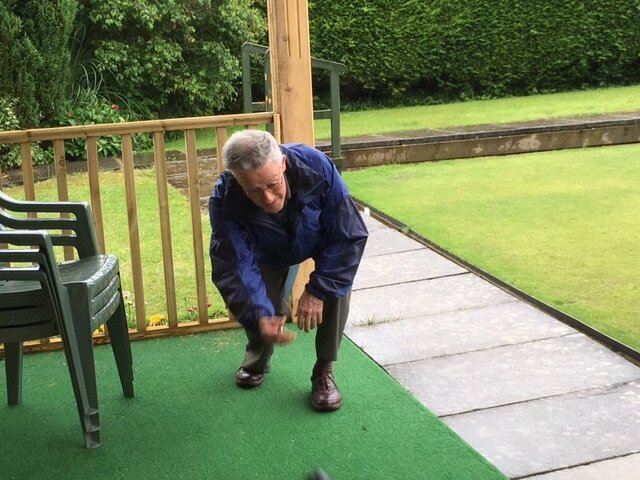 The rain didn't dampen the enthusiasm of Dave Hughes and John Eagle who improvised and played very short mat bowls on the verandah of the pavilion under the watchful eye of Iain Russell. Practise makes perfect! 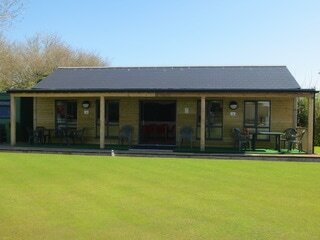 Just over a week to go to the Grand Opening of the new Pavilion. 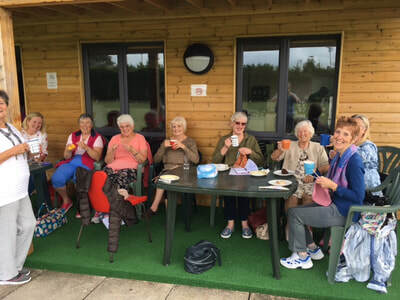 On Sunday 21st May, invited members and guests will celebrate the Grand Opening of our wonderful new pavilion that has already seen good use this season. All visiting teams, so far have been very impressed and complimentary about our new home. Please confirm your attendance with Brian Ilbery, so that final catering arrangements can be made. It promises to be a great social event, celebrating our great club and sport, with a local celebrity doing us the honour of carrying out the official opening ceremony. 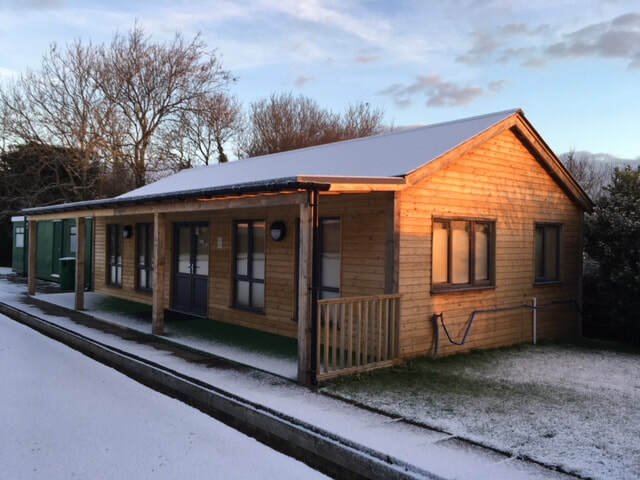 Click here to see the history of the new pavilion. 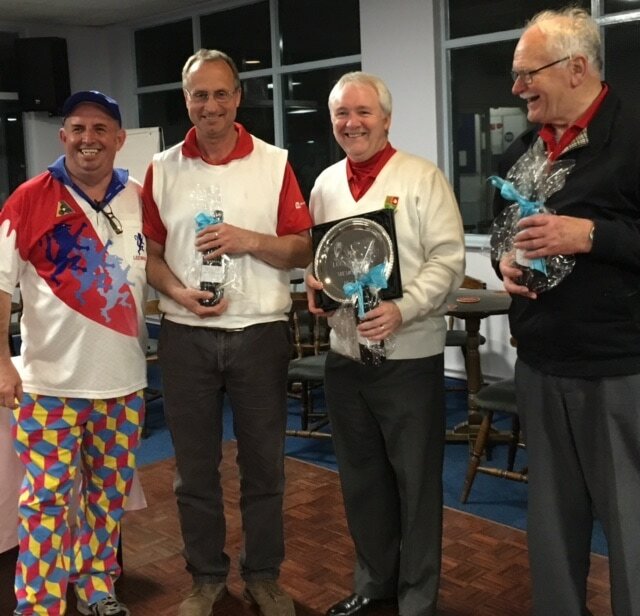 Three of our players, Mark Krawiecki, Peter Nevill and Iain Russell (Pentyrch Terrors), well-supported by Margaret Krawiecka, took part in a charity triples event at Cardiff Bowling Club on Sunday 30th April. The event has been run for the last seven years by Dave and Sharon Medlam, local bowlers, to raise money for Breast Cancer Care Wales and Marie Curie Hospice, Cardiff and Vale. So far these events have raised over £14,000. The teams played on 8 rinks in leagues of 4. The winners and runners-up of groups going on to compete in two knockout competitions: group winners for the Cup and second placed teams playing for a Plate. The Pentyrch team came second in their group and went into the Plate competition. They beat a team from Whitchurch Hospital in the 1/4 final. 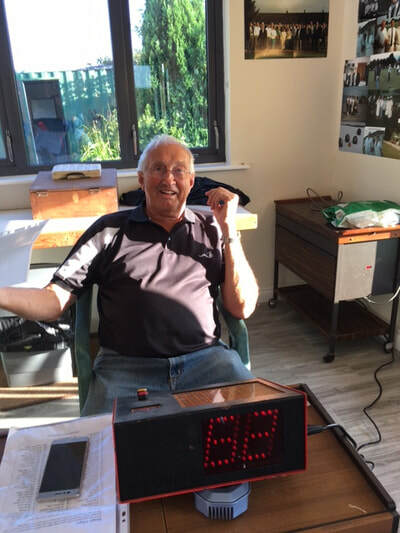 In the semi-final, with a draw at full-time, a very close extra end was won against a strong and vociferous Ely Valley team that included an international skip. 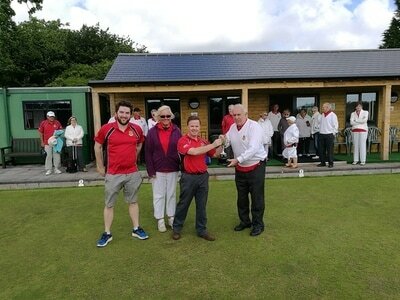 Pentyrch went on to win the Final against a team from Cardiff Bowling Club. 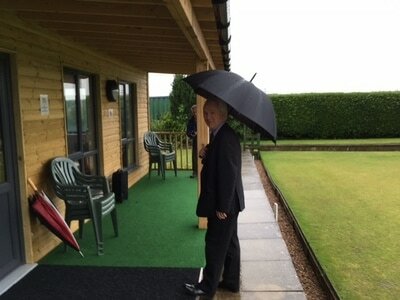 The weather had threatened to spoil the day, but although cold, only caused slight disruption due to the rain. 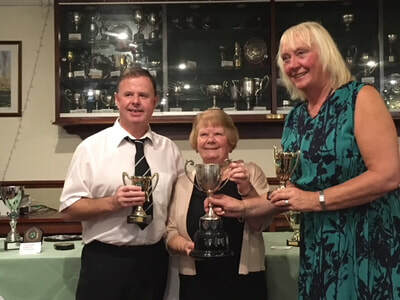 ​Special mention must be made again of Dave and Sharon Medlam and their family and friends who organised a hugely enjoyable event including raffle, impressive catering and prizes. 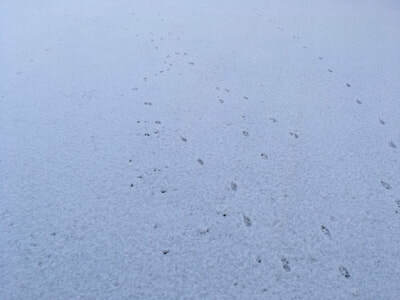 Entries for next year's event are already being taken. On Saturday 29th April we had our second Open Day - for report and pictures click here. With the best weather of the year so far, it is a great time to be opening the green for our 26th season. Come and have a roll up and get ready for the new season - 5.45 pm for 6 pm start. For many of us it will be a great chance to see the new pavilion for the first time, inside and out. Invite, or even better bring some friends along. Remember, too, that the Open Day is on Saturday 29th April - we need your help and support. 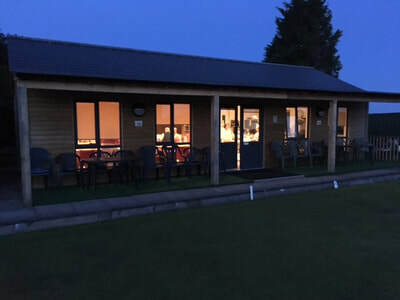 The official Grand Opening of the new pavilion takes place on Sunday 21st May at 3.00 pm - ​​​attendance is via invitation only - confirm your availability to attend with Brian Ilbery - thanks. The new pavilion is ready and open for business - to find out more, click here. 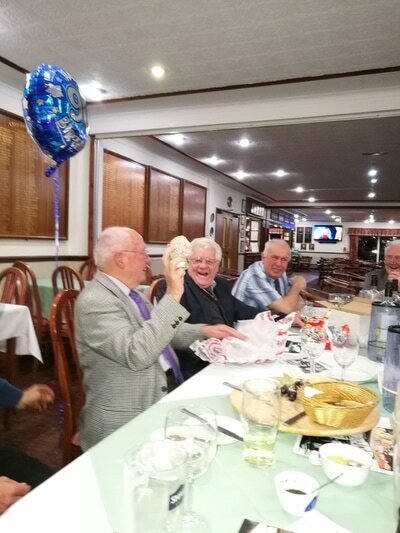 Former member and club stalwart, Oscar Evans celebrated his 90th birthday recently with former and current members. 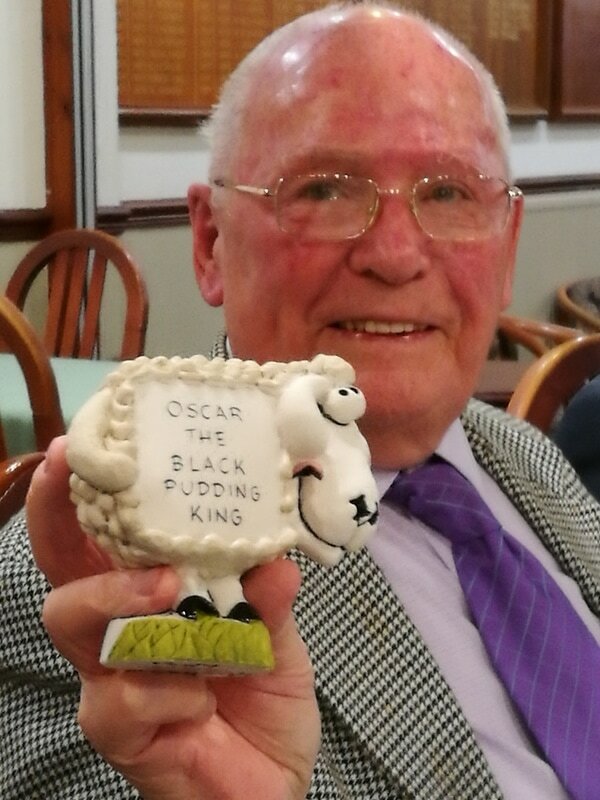 Congratulations Oscar - always welcome at Pentyrch Bowls Club. Margaret and Cyril Ellmes have club merchandise for sale - badges, pins, ties and bowls stickers with the club logo. See the items and prices available on the right. You can contact Margaret, Cyril or club captains to purchase . Thanks. One of our traditional start of season . The Cheese and Wine Buffet takes place at Pentyrch Rugby Club on Sunday 23rd April at 4.00 pm. Please, make every effort to come and support. We need to make as much money as possible at these fundraising events. It's also a great chance to meet people we haven't seen during the winter and hopefully a chance to encourage new members to join. We are happy to be associated with local Pentyrch estate agency business, Move2Here. They have arranged a referral scheme whereby they will donate £100 to our club for any successful referral that concludes in a completed sale. 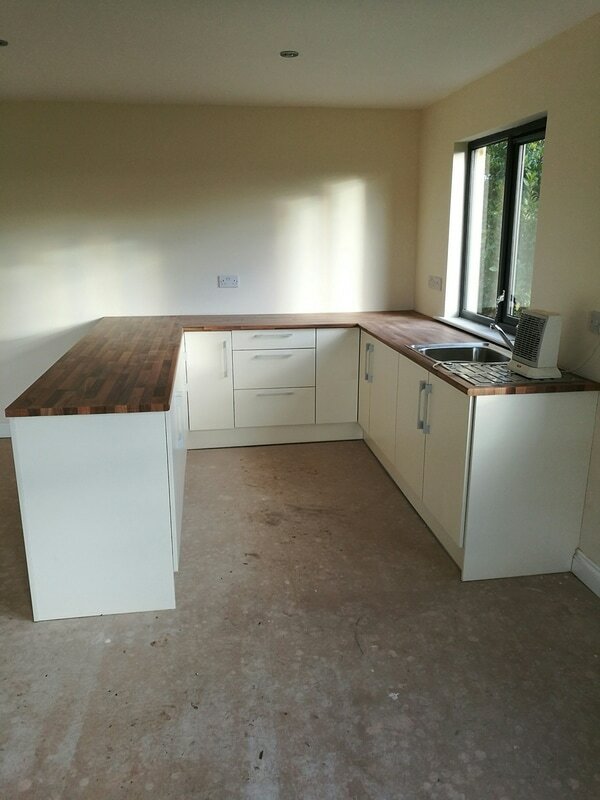 Click here and here for more details about Move2Here and their referral scheme. Please note the following amendments to the 2017 Fixtures. John Calnan Cup will be played on Sunday 11th June. 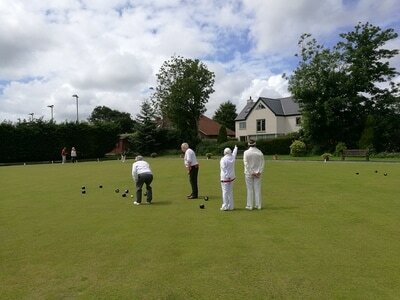 The Two Wood Competition will be played on Sunday 6th August. Times to be confirmed. 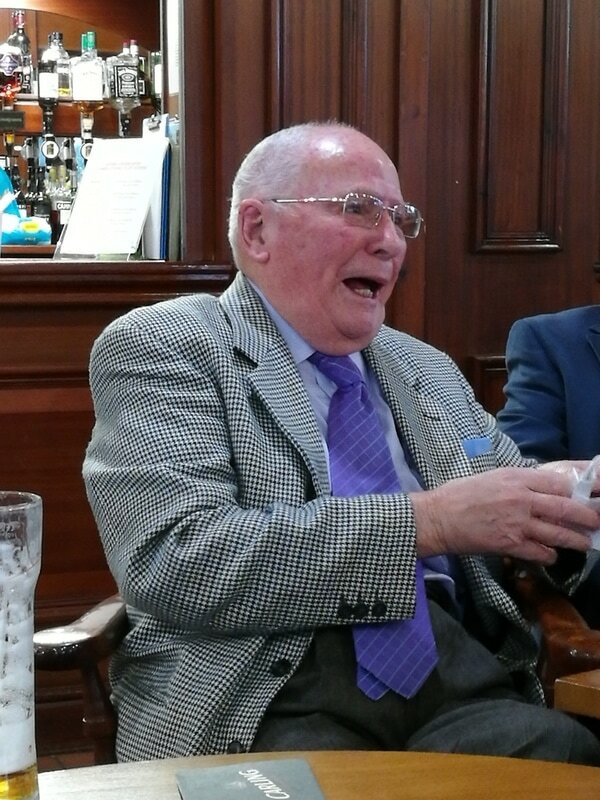 Congratulations and many happy returns of the day to Norman Poulson who reached the magnificent age of 97 on Tuesday 7th March. A long-serving player and member of our bowls club, Norman celebrated his birthday a day early at the Sportsman's Rest pub, Peterston-Super-Ely with friends, including several current and former members of the bowls club. Can you recognise any of them? Well done Norman! At last the new floor for the Pavilion is being installed. Click here to see pictures. 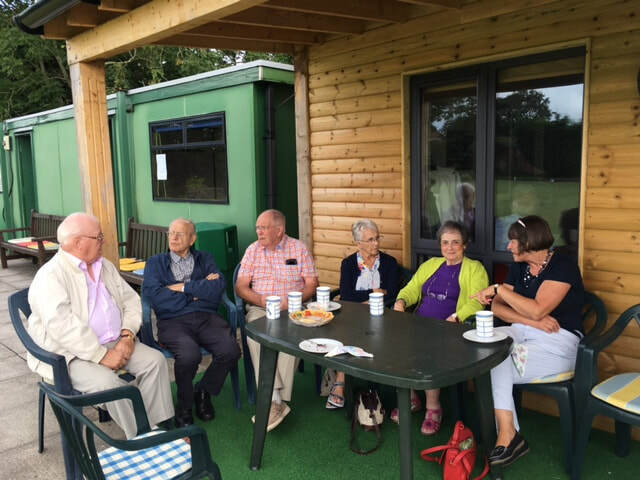 At the recent Management Meeting a date was set for the Official Opening of the new pavilion. It will take place on Sunday 21st May at 3.00 pm. More details to follow as we get closer to the date. 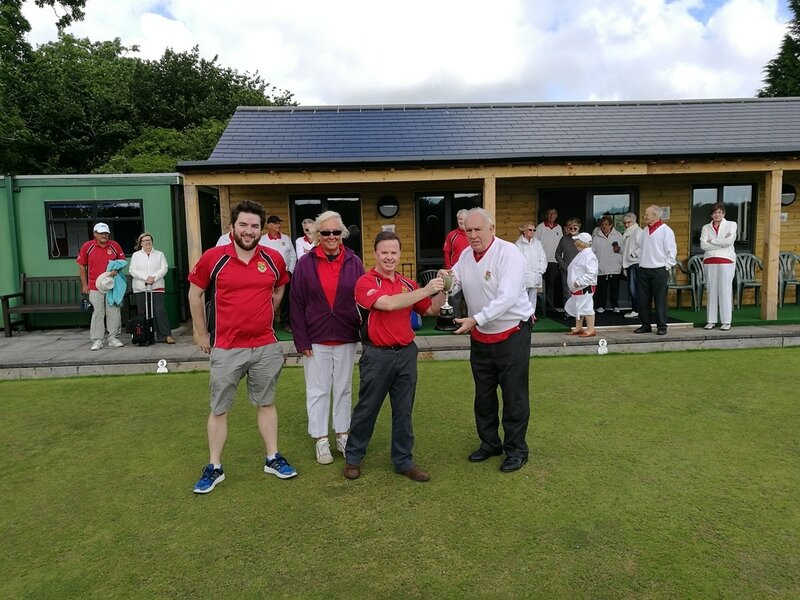 Following on form the success of last year's Open Day, the club will be holding another Open Day on Saturday 29th April between 12 pm and 4 pm. 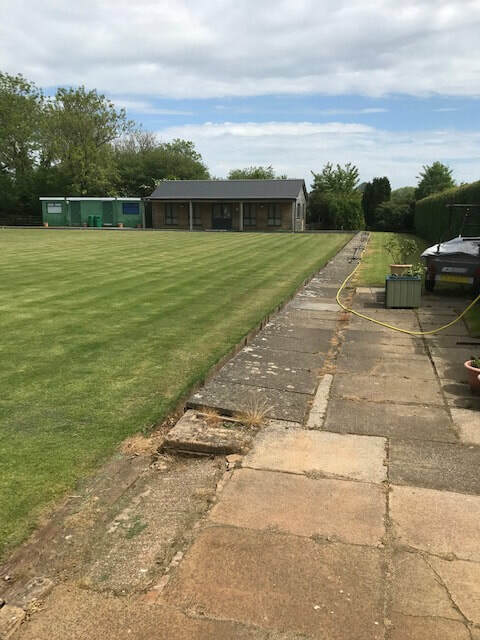 All prospective new members and players are welcome to meet new friends, try out our ever-improving green and see our fantastic new pavilion. The open Day will be organised by Mark Krawiecki, Brian Ilbery, Sheila Paul and Brian Pearce. All members are invited to help out before the event or on the day. Please contact Mark, Brian, Sheila and Brian with any ideas or offers of help. 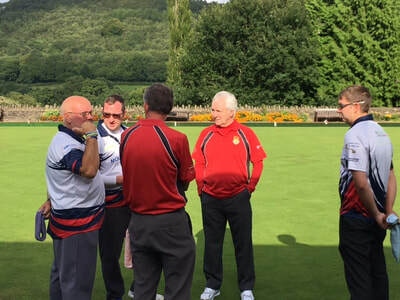 It's wonderful that after all the tours organised by Tim Morgan, Howard Thomas and Peter Mynett have kindly taken over the organisation of this year's tour. We will be touring in Wiltshire and Bristol. Our base will be the De Vere Hotel, Wroughton for the nights of Friday 2nd and Saturday 3rd June. On Friday our opponents will be ​Wanborough Bowls Club. On Saturday we will play against Wroughton Bowls club. On Sunday 4th June we are due to play against Yate Bowls Club, near Bristol on the way home to Pentrych. The club's first match of the season is on Wednesday 18th January at Penarth Bowls Club, Rectory Rd. It's the "second Leg" of the traditional close-season games on their indoor short mat green. New Captain, Howard Thomas is looking for a win and is picking a team from Men and Ladies. 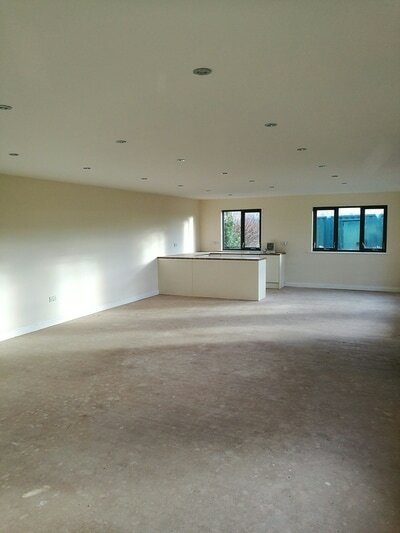 Our magnificent new clubhouse now has a fully fitted kitchen. Soon to be in action for the new season. Look out for further updates and news of any opening and celebratory events. Visit the New Clubhouse page here.